Both of our feeding stations have been taken down because neither has been visited by Sassafras, but have been attracting other wildlife. A few of the 200+ pictures are below. We'd like to express our thanks to the people who hosted the cameras - Greg, Sheila, Bob & Lisa - we couldn't keep going without people like you, who are generous with their time and yards. 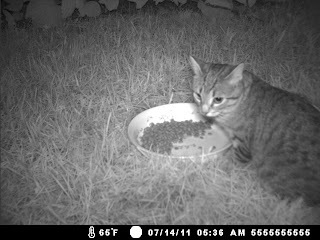 We are hoping Sass is staying safe and cool somewhere, but that she gives us a reason to put another camera out, soon. This video from May now has 1,500 views and tells the story of how Sass was lost and our early efforts. On Sunday, an American University student is interviewing us for a documentary to be completed Aug. 13. We'd love for that video to have a happy ending. If you've seen these signs and can pass the information along to us, we'd appreciate it. We were hoping to get by there today to see if we could find the signs, but didn't make it over. I have an odd memory of something like this more than a ago, but can't find any records, so perhaps this is new. The dog found near Landon school is not Sassafras, but rather a neutered male Jack Russell terrier. We received a call around 5:30 from someone in the neighborhood familiar with the found dog. Although of course disappointed, it's amazing to us how quickly this was resolved... From one call last night, to volunteers responding today to hang new flyers, to another stranger calling us today... less than 24 hours. Thank you to everyone who helped resolve this! Today's shout out goes to Meghan and Marisa at DogCentric who featured Sassafras in their monthly newsletter, thereby letting their 25 dog walkers and their clients know about our efforts. Also, the phone has started ringing again, but sadly not with much we can use. One child called saying she saw Sassafras walking with people on a leash on Petworth Avenue around 3PM. She couldn't give a cross street and given her youth there wasn't much follow-up we could do. Generally these sightings of a dog walking comfortably with other owners are not ones we follow because Sass was last seen loose and she's unlikely to go to a stranger. Plus, another crank call with someone saying "I've found your dog at 3925" and then they hang up. We have already posted it on Facebook. Email probably won't be effective with our age group, everything is on Facebook now. One idea to get word out to local kids and teenagers is to put signs in school gyms, and near the locker rooms. Fall tryouts for highschool teams start in just a couple weeks and kids will be in and out of the schools all day. Middle and Elementary schools will not be open until late August though. I would also strongly recommend trying to get your flyers or cards into the local pools, country clubs, and grocery stores. They usually have message boards where signs can be posted. A lot of kids spend their whole day at the pool, so it would be a great way to get the word out to younger people. I emailed a friend in DC who said she may have seen a similar dog on Tuesday near 37th and T Street NW running in the woods. She was driving so did not have a good look. She was 20 pounds when lost and has a few distinctive physical characteristics that set her aside from other lost dogs. Her RIGHT side is mostly black (with brown and white) while her LEFT side is mostly white (with black in the middle), her white-tipped tail tends to curl back toward her head, and her head is mostly brown with a white vertical streak and eyebrows, and her ears are shorter and less droopy than the average beagle. See her pictures for a sense of this. Let's hope people are getting close enough to see the difference and she end up home soon! You may have recently noticed posters for a lost dog in your neighborhood. Sassafras is a 3-year old female beagle-jack russell mix who has been missing since she escaped from her walker on April 8. For two months, there were no confirmed sightings of her. In the last few weeks, however, Sassafras has been spotted and later professionally tracked wandering around American University, Chevy Chase, Bethesda and near Rock Creek Park. She could, however, now be many miles from those areas. With the temperature rising, her owners are very anxious about finding her and bringing her home soon. If you spot her, please try to snap a picture on your phone (if possible), note her location and contact Beth or Jeff at 202-664-2301 (or email them at findsassafras@gmail.com). More information about the search is available on their website, http://findlostbeaglesassafras.blogspot.com/ , including maps of recent sightings and tracks, more pictures and videos, as well as a post explaining why the owners think Sassafras has been able to survive so long, the plan to catch her, and past efforts to get out the word. A team of volunteers have helped them hang more than 3,000 flyers and pass out as many business cards and their story has been featured in the Washington Post, and in all the local television media. They are super appreciative of all the help and really want to bring their lost dog home. Sassafras is highly unlikely to come to strangers and will run away if chased. She was 20 pounds when lost and has a few distinctive physical characteristics that set her aside from other lost dogs. Her right side is mostly black (with brown and white) while her left side is mostly white (with black in the middle), her white-tipped tail tends to curl back toward her head, and her head is mostly brown with a white vertical streak and eyebrows, and her ears are shorter and less droopy than the average beagle. See her pictures for a sense of this. I saw your signs and have read your blog. I am so sorry that you haven't found her yet. I am 15 and have two younger sisters (ages 13 &11). We live in [deleted for privacy reasons] and are eager to do anything we can to help. Please let us know if you need any help with the search in our area. See October revised version of this FAQ here. Q: Is it really Sassafras? Our sightings are confirmed by the tracking dog, which are basically 100%. If Sassafras' scent isn't there, the dog has nothing to follow. (http://www.puregoldpettrackers.com/) We had plenty of negative sightings where the tracking dog didn't find anything. To explain a bit more.... When we receive a phone call (or email) about a sighting, we ask lots of questions to see if the sighting was likely Sassafras. For those that are promising and we have a very specific location to start a track from, we bring in the tracker. The tracking dog sniffs a scent article three times (in our case, a bag full of Sass' hair and her brush) and then uses her nose to determine if she can follow that scent. Q: How is she staying alive? Our assumption is that Sass is chasing small animals and finding trash, as well as discovering water sources. We don't think someone is directly feeding her because the confirmed sightings have all come from someone who saw her alone and the tracks have covered a great deal of ground. During the tracks there is evidence that Sass is chasing animals and stopping at water sources. It is normal for lost animals to travel when people are not around. Now, because of the heat, and her shyness around people, Sass seems to be traveling at night. Our last confirmed sighting of her was 3:30 a.m.
Q: Why hasn't she been captured or come to a human for help? There are a lot of reasons why it's been so hard to catch Sassafras. First, Sass was only comfortable with humans in her "pack" (in other words, only we or her daycare providers could pet her... strangers could only pet her after at least 10 minutes in our company). Second, her breed(s). Beagles are born travelers, so Sass' 10+ mile radius of what she now considers her territory isn't unusual. It's a needle/haystack problem. One night we had a call that she was in a yard with a fence - all the property owners had to do was close the fence, but they chased her off the property instead, and when she runs, she runs fast. By the time we got there (another neighbor called us and told us the not-dog-people were chasing her), Sass was long gone. 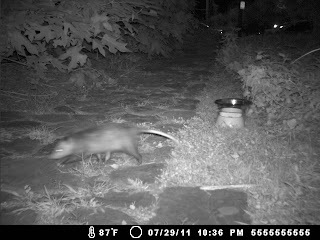 Second, because of the heat, and her shyness around people, Sass seems to be traveling at night (see question above). Dogs live in the now so Sass isn't reasoning that she needs to find people - she's finding food, water and shelter and in her brain that is her life now, she's not trying for anything beyond her needs. She doesn't think like a human, so we can't impose human logic on her thoughts. For shelter, she's probably curled up under a bush somewhere - we see plenty of places where this is possible on our tracks. We have heard of a lot of dogs that have been gone longer than Sass and survived - at the moment there are a couple of mastiffs who have been avoiding people for months - if an 80 lb dog can hide, our little Sass can certainly be overlooked. Q: How will you get her back? What's the plan? We're hoping to determine what her territory is. When we can, we set up feed stations and hope she will return to those. 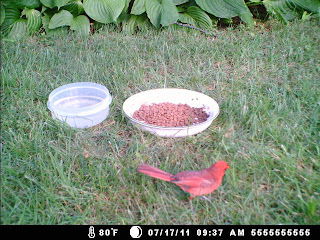 Where it makes sense, we also put a motion-sensitive camera by the feeding station. We hope to catch an image of Sass at one of those stations. We'll then set up a trap to catch her. Q: Why so many flyers? The best way we can get a message to people on the ground at the moment they might see Sassafras is through flyers. We can't wait for the day when Sass is returned and we can take down all the flyers! We realize that the flyers disrupt the normal appearance of an area in which they are placed (that's their purpose), but do ask that people not remove them. We are also trying to be as creative as possible in getting the word out in other ways. We have business cards that we pass out. We've placed ads in local papers, from the Washington Post to Street Sense. We've used FindToto to have 1000 robo-calls placed to area residents. We've also tried to activate social media and have messages on Craigslist, listservs, a blog with 23000+ page views, a twitter account, youtube videos, and more. Plus, we've reached out to local media and they have run stories, including the Washington Post, NBC, ABC, FOX, Chevy Chase Patch. A student at American University is now doing a documentary.... We receive new ideas all the time and try to incorporate those into the search and always welcome volunteers who can help get the word out. Q: What should we do if we see her? Snap a picture on your phone/camera if you have one. Make a mental note of what you see (dog size and coloring, especially face and tail) and exact location. Then immediately call us (and email us later). Calling her name or chasing her is very unlikely to work. See this blog entry for more ideas. Yes! A chip is a small device (RFID) that is implanted under the skin. Using a hand-held scanner, vets and shelters are supposed to scan any dogs brought in. We have notified the system in charge that Sass is lost, and they enter that into their database and communicate with vets and shelters in the area that a dog is lost. In theory, if Sass is scanned, the person conducting the scan will quickly discover that we're looking for her and we'll be contacted by the system. Q: Have you checked the shelters? Have you checked with animal hospitals? YES! Early in the search, flyers were sent to all the area shelters and animal hospitals. 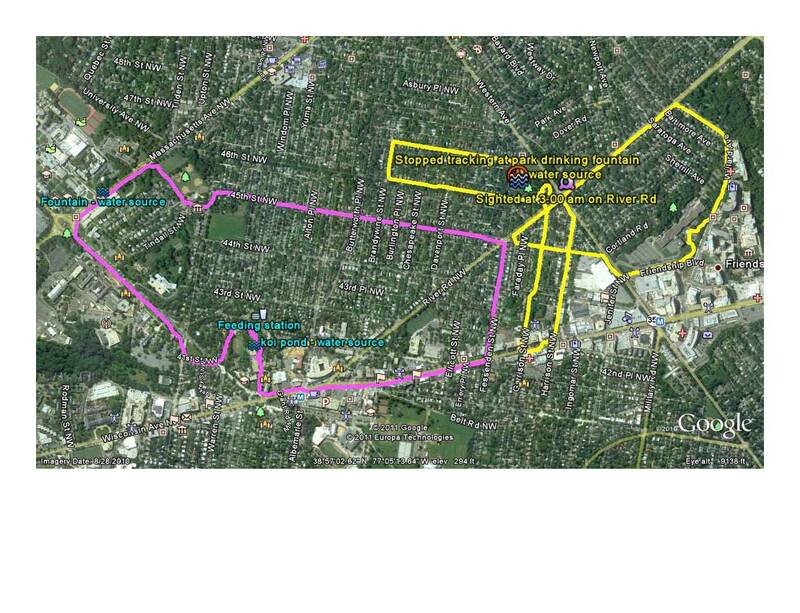 We filed lost dog reports in Montgomery and Prince Georges (and a number of other shelters). Most shelters put pictures of dogs up online for us to scan. We also have staff, especially at the DC shelter, who are looking out for Sass on our behalf. The tragedy for us is that we didn't lose her. Every day, Sass went to daycare during the week and did so for 3+ years. One day (April 8), when they had her out for a walk, she got out/off her leash. We really don't know how and the daycare feels awful. They have been taking care of her since before we knew her. The daycare was associated with the rescue from which we first got Sass when she was 6 weeks old. They are helping with the search by both volunteering and covering some of the search costs. We did just about all we could to avoid this tragedy. Sass has a chip. She has a collar that not only has her tags, but has her name and our home phone number stitched in. We couldn't do this without the support and advice of fantastic volunteers, most of whom were complete strangers to us before Sass was lost. There are about 10 people who help with flyering and dozens more who have help get the word out through social media. And there are even more who send in words of encouragement and follow the blog. WE CAN'T THANK YOU ENOUGH! If you have a cell phone, take a picture of the dog and call us right away. If she's in a yard where you can keep her contained, do so. It might mean closing a gate, or tossing her something to eat from afar. The only possible way she might - and this is a big might - approach a person is if you take the least defensive posture possible for a human to take. That means you don't look at her, you lie down flat, and you make soft noises. She might - big might - might just come close to investigate. Waiting is really difficult. No new sightings to report, and no pictures of Sass at either of the feeding stations. 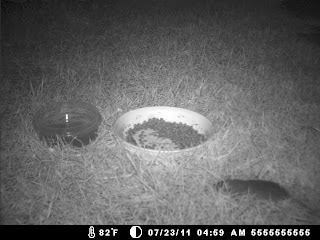 We had to take one feeding station down, because the property owner asked us to do so. We will work on refreshing flyers in neighborhoods where they've come down, and maybe think about changing the design somewhat so people know it is still an active search. We had a comment yesterday asking about what a feeding station is. 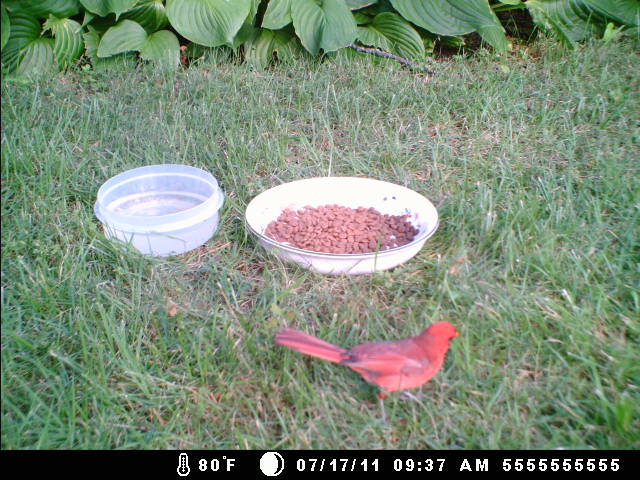 Essentially, it's a bowl of food and a bowl of water near something we can put a camera on (typically a tree). We also often put out a piece of old clothes with our scent, in hopes that Sass recognizes something familiar. In the latest news video there is a clip of station that used to be at AU Tenleytown at about one minute and ten seconds (1:10). Technical difficulties - camera update - was it Sass? Hi Beth & Jeff - my heart leaped when I came this morning bc all the food had been finished! When I loaded the pictures, they were no new ones after 8:40p when I was at the station, which means I didn't get the SD re-formatted to accept new. Drat, was it Sass last night?... still working on camera issues. No Sassie again this morning. Two other dogs -- different from before and both with collars, one clearly on a leash -- did polish off the food, though. Unless you disagree, I'm going to put a nice note up by the food and ask the dog owners to try to keep the food for Sassie and other homeless souls. I get a lot of calls asking if we've found Sassafras, but one last night was slightly different. The caller has a beagle/corgi mix that he walks in Chevy Chase/DC and he apparently gets stopped regularly by people asking (or, in some cases accusing) him of having Sassafras. His dog is a male, so he's got an easy way to prove he hasn't got our pooch, and he was extremely good natured about it, but he does have an extra reason to hope we find her quickly. It's nice for us to hear that people are out there looking for her! Possible Sighting: Barnaby and Worthington a little before 7 a.m. This morning I got a call from a woman who believed she saw Sassafras at Barnaby & Worthington. This would only be a block or so from the first confirmed sighting we had, so we do know that this neighborhood is part of her territory. However, we also had a false sighting just two blocks from there of another wandering beagle a couple of weeks ago, so it's hard to know what to think. I called our tracker, Sam, and asked for her input on whether it was worth doing another track, and she came down on the side of no. We know this is her territory, so a new track won't tell us much. She moves, and there is little to no likelihood of catching her on a track. Those are for informational purposes, so we know where we should be putting up flyers and getting the word out to ask people to watch for her. So, today I hope to be able to ask volunteers to check the flyers in the area, over to where our feeding station is on that side. Q: "But how do you go about actually catching her?" @Ellen asked: "It seems like you are closing in on her. But how do you go about actually catching her?" Well, we're hoping for one of two scenarios. In the first, Sassafras' wanderings take her into someone's yard. That someone has seen our signs, recognizes her, is able to keep her in the yard by closing a gate, or bribing her, and calls us to come and get her. She was, actually, in a yard that had a gate a couple of weeks ago, but she was chased out of the yard. It breaks my heart a little every time I think about it. There were flyers up on that street, we'd emailed local listservs - it just didn't happen for her or for us. The second scenario involves the feeding stations and cameras we have set up. A beagle will never forget where s/he scored food. And now that we've established some broad outlines of Sassafras' territory, we're trying to put her dog food out for her. We hope that the combination of her food and my scent (the lucky homeowners that have agreed to allow us to set up a station on their property also get one of my old maternity t-shirts that I spend a day in - the sweatier the better) will bring her back for more. If we can establish a pattern where she does come back regularly we can set a trap for her. Or, as my dear husband says, "Forget the trap, we'll just set up a tent." Everyone keep your fingers crossed for Sassafras! Jen has had good ideas for us in the past that have helped us get the word out. This time, she volunteered to go out after midnight to find taxi drivers, security people, etc. - anyone she could who works the night shift - to ask them to watch for our Sassy girl. Tonight's after-midnight handing out of business cards was interesting. They were out between 1-4 a.m.! Amazing! 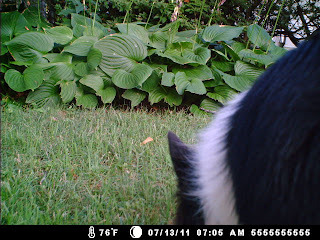 No Sassafras on the camera this morning. The second camera was delivered early today, so I have it with me and will set it up after work at the other end of her known territory. MORE GOOD NEWS - most of the people I run into are really concerned for you and Sassafras, and ask about it, and tell me how everyone in the neighborhood wants you to find her. A woman who said she works at the Finnish embassy follows the blog, and has gotten others at work to do so. They are keeping their eyes open. The woman says she noticed that the water bowls in the parks are often empty, so she carries a bottle of water with her when she walks so she can put some in. Here's last night's map! She actually walked right by the houses of two of our volunteers! No Sass on the camera today. We're installing a second camera (we hope) tomorrow at the other end of her known territory. I'm really happy about this one as the yard is fenced and the neighbors are one the lookout. Flyers went up today in new areas, and were refreshed in some older ones. One volunteer reported that what she put up was almost immediately taken down. Someone out there is not a dog person. We do realize that there will be some people who consider our signs litter, and just as awful as the commercial folks who plaster every pole with an offer to buy your car for cash. But I'm trying to save my dog's life, and I would be happy to go back and take down every sign out there if we can just get Sass home. Thrilled! I have daydreams about a bonfire of those signs, actually. If you live in one of the neighborhoods where we have flyers up, please let us know if they need to be replaced or refreshed. Please talk to your neighbors and tell them our story so they know how those signs represent our sincere and humble request for help in bringing her home, and while it might seem like they're everywhere, they are actually targeted to where we know she's been recently and where we hope she'll return. I promise to come take them down when she comes home! Salsa followed Sass' scent up and down up and down - we wondered if she was looking for water, because there were no obvious sources tonight. 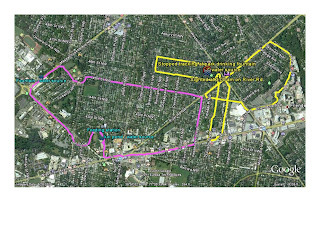 She skirted the AU campus, and wandered into a new neighborhood, so there will be more flyering to do this week. Tired now, but will post more when we have the map. We're going to pick up the track where we left off. Sam doesn't necessarily think we'll learn much more at this point about her territory, so this is really an exercise in making Jeff and I feel like we're doing *something* to get closer to Sassafras. This weekend, it couldn't be done without the help of Molly, Kristin, Mark and Tom, who have traveled from Richmond to help. Also, a few hundred more flyers up today in new neighborhoods that are the in-between spaces between tracks. I know that this isn't oriented correctly. I'm working on it! Once again, we're looking for volunteers to help flyer - new spots and old. Sassafras' information needs to be in front of people at the right time/right place for us to get that call that brings her home! If you can help on Saturday, please send us an email at findsassafras@gmail.com! 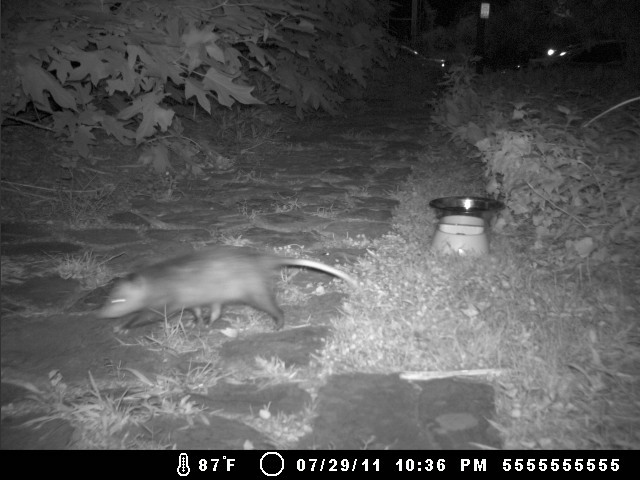 We ran a track tonight, and confirmed that the call I took at 3:30 a.m. was, indeed, a sighting of Sassafras! We were less than 24 hours behind her! In other good news, the tracking dog, Salsa, had an ultrasound and check-up yesterday, after finishing her last round of chemo last week. She is cancer free! Thank-you, Southpaws! (The same clinic where Sassafras has had her epilepsy treated - Jeff always calls it "pupilepsy.") Hurrah for Salsa! A man called at 3:30 a.m. to say he thought he saw Sassafras at River and Western ("mostly on River, crossing the street, heading down the hill"). This was as specific as he could get with directions, although he did say we could call him back at a decent hour later today. If this is when she's traveling, no wonder she's invisible. No Sassafras on the camera. We're waiting and hoping that she'll show up there, or that the phone will ring with good news. Huge thanks to Jenn, who is helping us by checking the camera. We absolutely, positively could not have gotten this far, and stuck with the search this long if it wasn't for the kindness of people who were strangers to us just a few weeks ago. It's amazing. We heard back, and it was not a sighting of Sassafras, just a re-post of information asking everyone to keep their eyes open for her. Our thanks for the neighbor getting in touch with us quickly - we appreciate all the help from folks that our watching for our girl. Just a cat that came by around 3:30AM... Sass, where are you? About 2PM today, we received 3 calls from the authorities in Chevy Chase Village demanding we remove all signs immediately and that they were planning to fine us for each sign. Super volunteer Lisa, and her husband, have helped us remove the signs, and we think we got them all. Now we're looking for stores who might be willing to put signs in their windows, or homes that might be able to legally post them. (We're not actually sure what all the regulations might be). Plus, we'd love to get messages out via listservs that reach residents in the neighborhood. Flyers are available on this blog (see "Search Materials" way down on the right) and we'd appreciate posts to listservs. Send us an email if you'd like suggested text for a message to area listservs. Update: Our thanks to Robin S., who helps a lot of people around our corner of Maryland with lost animals. She was able to post to a number of listservs to help get Sassafras' information to residents. More flyers went up today in Bethesda, and we're working on updating the map. Our thanks to Lisa, Kerstin, Michelle, Jen, Jenn and Jeanne. We will be setting up a new feeding station tonight, where Sam suggested one. The homeowners have agreed to allow us to do this, and we're grateful to them. It was a privilege to go on the track, to meet Sam and Salsa and watch them in action, and to learn from Lisa, who has lots of experience with dogs (and their people) through her work with Homeward Trails' rescues. It is quite exciting when Salsa picks up Sassafras's scent. What follows is a suspenseful adventure through some beautiful and upscale neighborhoods, thanks to Sassafras's champagne tastes. She, and consequently we, even made a stop at the Columbia Country Club. All of this has the added benefit, if you are a walker and explorer as I am, of great exercise, education, and interesting encounters with helpful people. The best part, though, is knowing that Sassafras has been seen, can be tracked, has food and water sources, and remains safe to be found and returned to her family.